A comet is a chunk of ice, rock, and gas flying through space. When they get close to the sun, they heat up. We can see their glow and long tails. 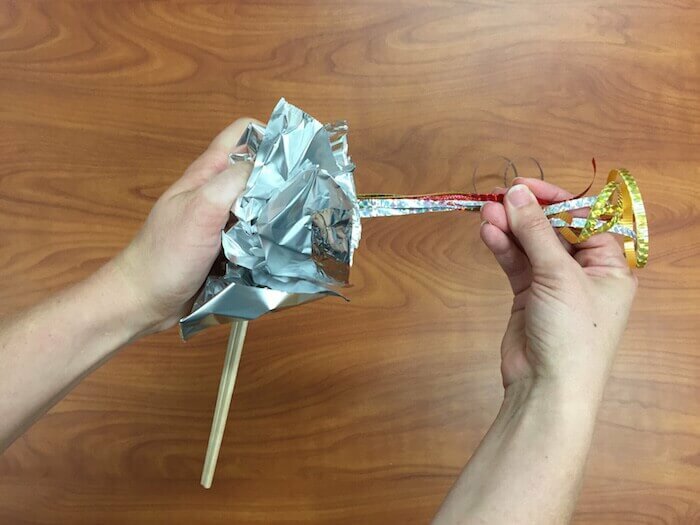 In this activity, you’ll make your own comet that can fly around the room! 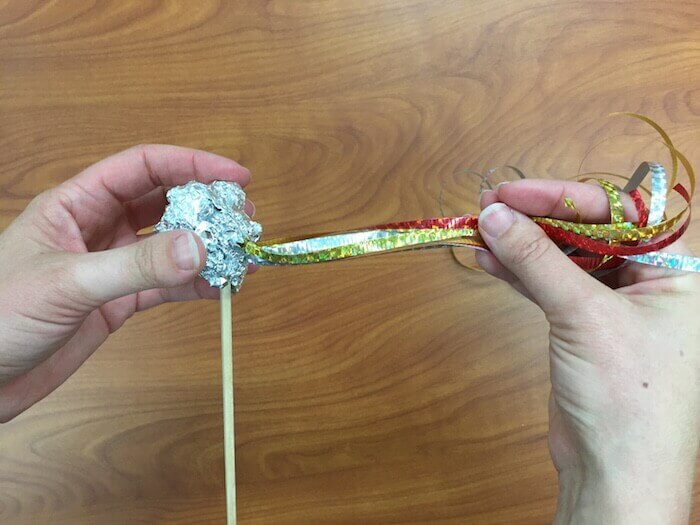 If you have three different colors of ribbon, you can make a very accurate comet. Comets have a nucleus, which is the main body of the comet. They have a coma, which is the glowing part around the nucleus. Then they have two tails: a dust tail and a gas tail. 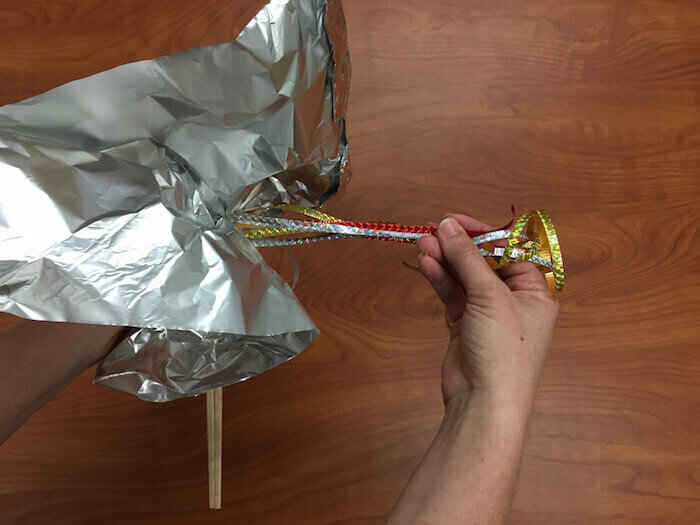 In our "comet on a stick," the tin foil is the nucleus. The red ribbon is the coma. The silver ribbon is the dust tail, and the gold ribbon is the gas tail. 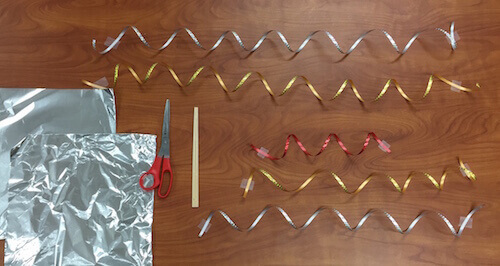 Cut five pieces of ribbon: two long pieces, two medium pieces, and one short piece. If you want an extra long tail, make the long pieces about three feet in length. 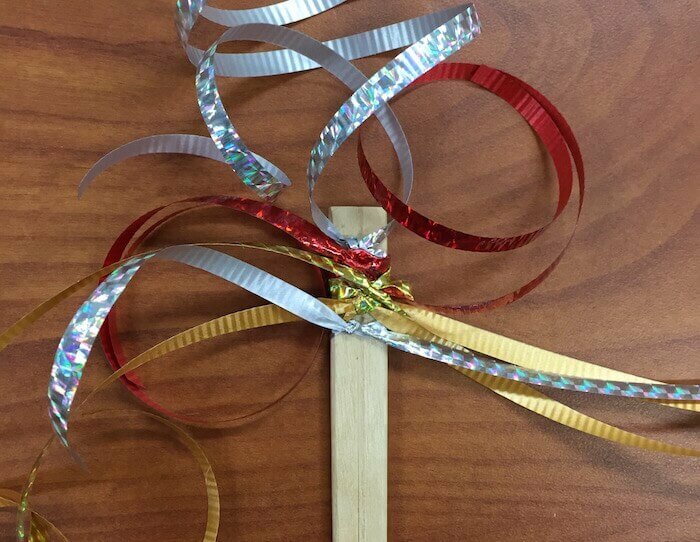 Tie your ribbons around the end of your chopsticks or popsicle stick. If you want the ribbon to be as long as possible, tie the knot close to the edge of the ribbon. Cut three pieces of tin foil so they’re roughly square shaped. 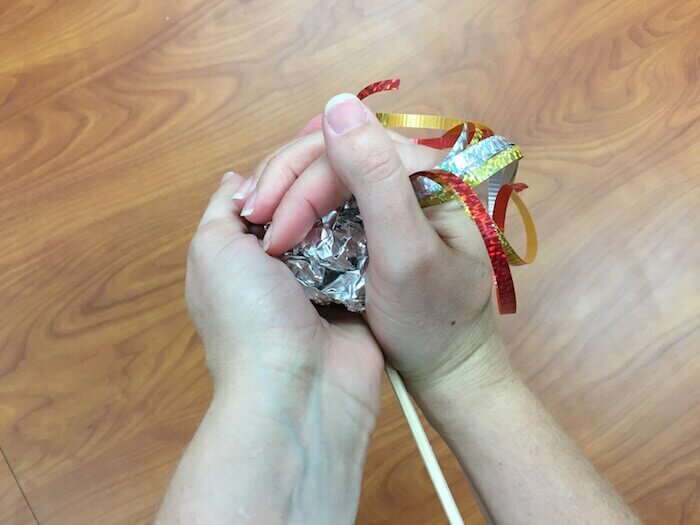 Hold the ribbon pieces off to one side and gather the tin foil around the end of the stick. 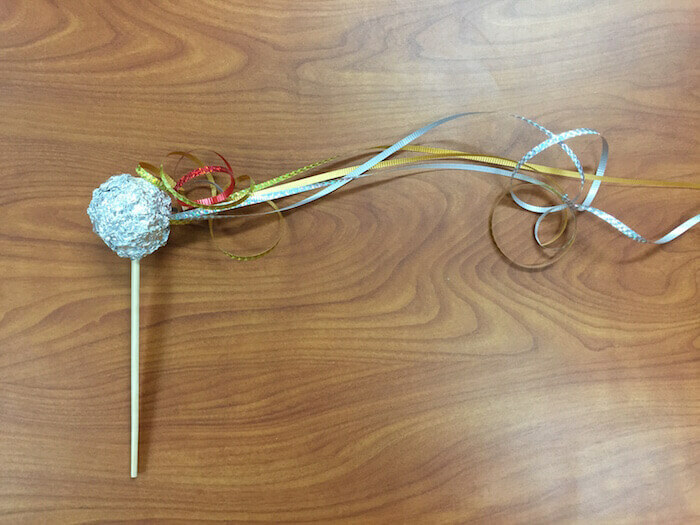 Form the tin foil into a ball while keeping the ribbon tail off to the side. Repeat with two more sheets of tin foil. Gather it around and form it into a ball. If you want a bigger comet, add more tin foil! Take your comet on a stick and fly it around the room! No two comets are alike. They differ in size, shape, and what they’re made of. Comet tails are a result of solar wind. Energy and particles from the sun push on the comet. This force pushes dust and gas behind the comet. The ion dust and gas have different weights, so they separate, making two specular tails. Once scientists saw a third tail, which was a smaller tail forming just between the dust and gas tail. They discovered it was made of salt. Comet tails have been discovered to be so long that Voyager 2 passed through one that was thousands of miles away! Not to worry. We've got you covered. We have games to play and more to learn.